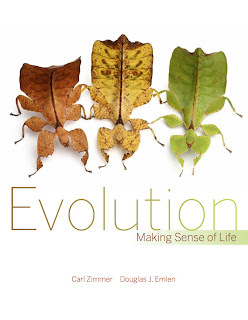 "I saw a leaf-bug walk past, and then another one just like it walked past." "How much like it? Was it the same leaf-bug?" Those who believe fairy tales like creationism are the morons, sir. Oops, you got the numbers backwards from the survey. 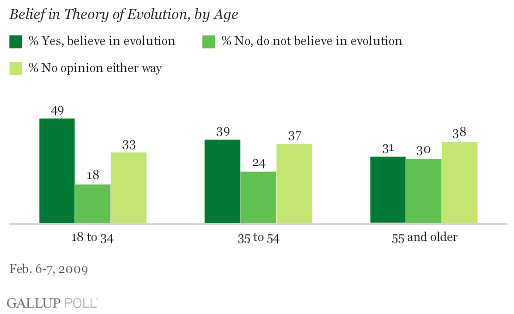 Only 40% DO believe evolution is correct. That's low. On the plus side, only 25% actively disagree. Thanks Marmaduke, it's fixed now. 39% believe in evolution, 36% don't know, 25% deny it. I'd prefer it if they'd asked the question differently, because "believe" suggests that this is a matter of opinion rather than fact, but I can't change that. I’m glad you seem to take this in stride, but I have to wonder what has gone wrong with education, not only in the schools, but in the wider culture. Even most people who accept evolution couldn’t tell you much about it, so they are as guilty as the creationists for simply “believing”. We seem to have utterly failed at teaching people to THINK. It reminds of the “debate” about GMO’s. Very well-educated people will rant and rave about the “dangers” of this technology, but when you ask them for one single source of harm to humans, they only splutter and can’t imagine that you doubt such a “fact”. The best I’ve had from them is some completely woo-laden sites that don’t cite anything. It’s called a “controversy” the same way that evolution vs. creationism is, implying that the arguments for either side are equally valid and one can simply think it over and “choose” one or the other. I don’t mean to get off-topic, but this example has been in my face a lot lately and I’m finding it harder to deal with than the creationists, which I can at least write off as religious ideologues. I think that evolution is plan to see. It is in everything big and little. As change is the only thing constant. I am not sure how old the idea of evolution is. All I know is that the proof is in the pudding. We would not have the ability to carbon date archeological finds and get a date past 10,000 years ago, if the Earth and Universe had only been around that long. The species trail is so long. If you just use a little common sense, look closely, and question, you will see the path that has led most everything to where it is today. The parts about common sense and questioning is where a creationist gets stuck. They do not seem to have those abilities. They'd rather do as they're told. but no scientists. Who knew? Thanks teach.